When it comes to threads, we all know the name DMC. It’s the most widely available embroidery thread in the US, and perhaps in the world. You can find it everywhere, from the big box stores to the local needlework shops. Most kits and charts written today, if they don’t actually contain DMC thread, have the conversion options for DMC thread. The company’s been around for ages, and although it has gone through ownership changes over the years, the name and the threads are still around. I use DMC threads often. I have two favorite DMC threads: floche and coton a broder #25 (also called “special embroidery cotton, DMC 107”). I use these two threads for monogramming, especially, but also for other surface embroidery. Neither thread is as easy to come by as DMC floss (stranded cotton) or perle cotton in the various sizes. You have to look for floche and coton a broder in specialty shops. Here in Kansas, no one carries them, so I order both of them online through Vaune, which is a shop primarily devoted to smocking. When it comes to whitework embroidery, DMC’s coton a broder in sizes 16 through 30 are my go-to threads. 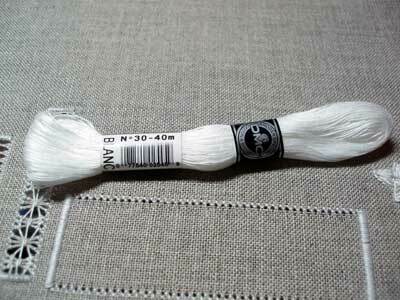 They’re wonderful threads for whitework! They used to be available in sizes 12 – 40 (and even higher, years ago), but the line has been reduced, and size 12 and higher sizes (35 and 40) are apparently extinct. DMC is a reliable cotton embroidery thread. I use the threads mentioned above, plus I have a good supply of floss and perle cotton that I use for teaching children, for stitch samples, and for making how-to embroidery videos. One definite advantage to using DMC (or Anchor – I like Anchor, too, but it’s harder to find in the US) over over-dyed, hand-dyed, and other cottons is that they are pretty much colorfast. 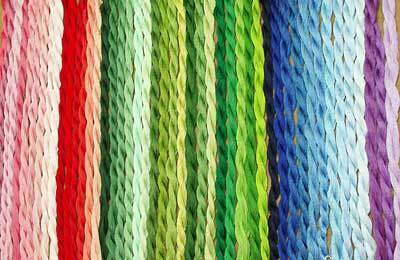 You’re less likely to run into problems with colors bleeding with these threads. The other advantage to DMC is, of course, its wide availability and the fact that it’s relatively inexpensive. Newsletter Readers: You can view the video here in today’s article on Needle ‘n Thread, since it won’t show up in your newsletter! Incidentally, I believe the made-in-France “campaign” DMC is currently using to promote their threads (not their other products, like accessories, fabrics, and tools – these are a Whole Nuther Story) is in response to the speculation going on in the US needlework world about a decline in quality of DMC’s threads in recent years. I’ve heard many designers, instructors, and long time stitchers complain about an apparent decline in quality in the threads. There have been rumors circulating regarding whether or not DMC outsources their threads. Some folks wonder if the threads sold on the US market are the same as those sold in France, for example. Apparently, one reason for this speculation is that there’s a major price difference between DMC in France & Europe and DMC in the US – the cotton floss is much less expensive here in the US. Evidently, this seems odd, considering the threads are made in France and to get them to the US, there’s the whole question of currency conversion and import fees and so forth. Admittedly, I’m thankful that the thread is so affordable here – I use hundreds of skeins a year in samples for the website and while working with kids. It would be problematic, budget-wise, to use a more expensive thread for this type of stitching. Other folks have suggested that perhaps the thread sold in US “big box” stores is different from the thread sold in local needlework shops in the US – a scenario that’s pretty highly improbable. The company also took steps to move the bulk of its production to the Asian, African, and eastern European markets to take advantage of lower wage costs, while maintaining only high valued-added operations in western Europe. This doesn’t necessarily mean that their threads were all outsourced, but you can see how such rumors could have a damaging effect on the trust and confidence that people put in DMC threads. So it seems that right now, to counteract such speculation in the US market, DMC is “marketing” the roots of the company and promoting the “made in France” aspect of their threads. I think what “big” needlework businesses are doing to market their products is interesting to watch, because, in a sense, it reflects what’s going on in the wider world of needlework in general. The move to generate interest in DMC’s roots and how their threads are made is a reflection, I think, of the growing demand by needleworkers to know where their products come from and to be assured of the quality of the products they purchase. This is a healthy sign for the fine needlework industry. I think it’s a positive indication that we are becoming more and more interested in acquiring quality products from quality sources, because this means that we understand better and appreciate more, the value of our needlework. What’s your take? Any thoughts? Do you use DMC threads? Are you a die-hard fan of DMC’s thread? Do you have other cotton threads you prefer to DMC? Do you have any thoughts on DMC’s recent emphasis on their company’s roots? Do you think it helps boost trust in the continuity and quality of the company’s products? I’d love to hear your thoughts – have your say below! What is the “wire” they are referring to in the DMC video? mas principalmente a DMC…as cores são muito bonitas e brilhantes…. DMC … but mostly the colors are very beautiful and shiny …. I have searched for DMC coton a broder on DMC’s website…no results. I wonder why they don’t list it, even if it is sold only at a handful of stores. Maybe if they would re-introduce coton a broder, marketing it as a higher end specialty thread, they would be pleasantly surprised at how well it is embraced by stitchers. Quality is my first choice, but in the case of coton a broder a little quanity would be nice too! I recently wrote to DMC asking them to make coton a broder/special more available here in the US. I figure if enough people make it known to them that there is desire for this floss maybe they will do something about it. Fascinating video, Mary. Thanks for sharing it. The ‘wire’ is just a poor translation of ‘fil’ – the word means ‘thread’ in this context. cross-stitches and embroiders only occasionally, I use DMC, only because I had no idea there was anything else 😉 Just recently, I have decided to venture out and have discovered other brands though I have never found them anywhere – so I use DMC anyway. It’s reliable, it’s inexpensive, I love the colors, they never run when washed. I would be nice to have the opportunity to another brand but they’re just not available. I think the issues regarding pricing in general for needlepoint are very interesting. I needlepoint and live in Turkey, in Istanbul. We have DMC thread. It says it’s made in France, and the label says “For Sale outside the European Union”. I pay about $1.00 or so for the plain cotton DMC, more for the glittery polyester ones. What is interesting to me is that Greece produces a lot of needlepoint canvases, so does Poland. These canvases are so moderately priced, it’s unbelievable. I guess it’s the poor economy there, but I have bought beautiful large canvases for only 40 lira–about 22$. I also find French canvases on sale for abot $10. I think Turkey gets alot of surplus, overstocks (and so do alot of other Middle Eastern countries) because there is a large crafter’s market–so many women in the EU knit, needlepoint, make lace, etc. So Turkey is lucky to get the surplus. For an American, this makes me so happy, because I used to drag back suitcases full of canvases, DMC threads etc. I guess sewing is the world’s second oldest profession-it’s everywhere! Well, I have some DMC threads – mostly more specialised stuff like linen and metallics, and of course, threads in some kits, but I normally use Anchor, which is made in Germany near to where my hubby was born and grew up. Maybe one visit I’ll try to see if the public can see the factory in Kenzingen. Anyone know about this? Like DMC, Anchor threads are colour fast to a high temperature and they really are made in Europe. I think Trish Burr said she found they snapped easier than DMC, but I’ve never pulled them hard enough to see for myself!! I chose them partly as that was the brand that was in the old threads my mum gave me years ago and partly as, like my little family, it’s an Anglo-German co-operation!!=)LOL! Hi, Mary. I use DMC thread and recently tried to create a monogram on my husband’s shirt cuff. The size of monograms on his other shirts is .75″ wide x .25″ tall. I used two strands of thread as one seemed too little. What I ended up with was too thick so his long-sleeved shirt is now a short-sleeved shirt. Good thing it is summer. He is entrusting me with another shirt so if you have any suggestions about threads or number I strands for such a small monogram, I would be most appreciative. And, use magnification, not just readers. I’m pretty detail oriented and could not believe how much good magnification helped with monograms, 1 strand DMC padded satin. Yes I use DMC, nothing special, just the regular, 35c, six strand stuff because it is what I can easily find, there are plenty of colors and it is affordable. “Affordable” is different for different people, in my case my medication is 400$ a month, so for me, even a few dollars a skein for the fancier silk or wool stuff is hard. Even DMC is sometimes frustrating because the closer of the two craft stores (a general craft, no fabric, 8$ daily bus pass) I can easily get to (I am epileptic and can not drive) has an annoying tendency not to restock until more than half the colors are out of stock. Also when new colors (like the variegated) are released, they take YEARS to begin to stock them. I suspect the reason they don’t stock until they need to is because of Californias inventory tax (stores have to pay a state tax on thier inventory, the more you have the more you pay). The farther store (a fabric and craft store, still 8$ daily bus) keeps thier regular stock up but it also tends to be a year or two (less time than the other however) before they stock new colors. There are no small needlecraft stores near my home, only the two craft giants I mentioned, plus a third giant a bit farther away, larger than the other two combined but more difficult to get to. Now that I think about the third, it IS the other two combined as far as inventory. All the small needlecraft shops I know of are in other towns, in historical “old-town” areas. Our local Walmart (I can walk there) used to stock DMC, however, when they remodeled the store (made it BIGGER) they got rid of thier sewing, fabric and craft aisles. The only “craft stuff they have now, is a few bins of yarn and some beading things. I try not to order things online unless absolutely necessary, however, I have had to resort to purchasing some DMC colors online, but I always do (not even anually, just ocasionally) so in large batches, otherwise I wind up paying more for shipping than the floss is worth. I have not noticed a difference in quality and I have been embroidering for almost 2 decades but maybe I just don’t pay enough attention to gossip. I cannot say that I am a die hard DMC fan, because I have not tried the other major types, since I do not know anywhere to buy them, with the exception of the non name brand floss that comes in the multi packs (offered for friendship bracelets lately) of 100 skeins in various colors, however, I quit using that stuff after a couple of projects back at the beginning of my embroidery “career” because if I ran out of a certain color it was so difficult to find another package or whatever once the store sold them out. Even the same brand had more bags of floss, the red, blue or whatever color was never the same in the next type of bag. I guess the colors are not standard like DMCs are. At least DMC used to (before thier ability to standardize) put ‘dye lot’ numbers on thiers so I could make sure I had the correct one. Also in those bags, I have tons of colors but no place to use them so they just sit there and take up space in my ‘stash basket’ (one of those old accordian handled wooden baskets made in scandanavia somewhere) sometimes for years until I found a project where I needed lots and lots of lemon yellow because I bought 3 bags needing the kelly green but all the other colors I did not need. Now, I only stash DMC in my basket because it is easily replaceable, and I don’t have to buy excess stuff with it (like 2 more bags for the green inside, but all the other colors I don’t need) that I won’t necessarily need. I think most businesses go through a “history book” phase, for various reasons, and it could be that the extended recession is ouching thier business a bit, but I have no idea what thier motivation would be, and to be honest the fact that they are doing this does not bother me in the slightest, unless there is definite proof that the thread has been outsourced but they still claim that it is made in france. I do order from Herschners online now and then, but ordering 2-3 skeins at a time and waiting 10 days for them is ridiculous for me. I am the only one I know who embroiders. My granma used to, but about a decade ago her arthritis got so bad she had to stop. I know one crocheter and a knitter or two, but few people I know have any hobbies. I know that seems wierd, but when I get my embroidery out in public people usually sit and stare at me as though thier brains fell out. I like DMC. It’s easy to find and cheap. Probably if it were better made then I couldn’t afford it and I’d hate to give up embroidery. I’ve used the super cheap off brands too. I don’t like them as much but they work in a pinch. A thought about the difference in price here. Most countries in Europe are small compared to the US, we literally buy more floss in some STATES than they buy for a whole country, so bulk purchase may be the reason for the price difference. Also, who knows what import taxes are applied over there. In most places in Europe, the tax is around 20%, already included in the price you see in the store. It’s not added to exports. Ahh yes. That VAT tax! Eeek! I thought the same thing Cindy. The US buys so much that surely the cost would come down just due the sheer volume of product being purchased. I work for a small manufacturing firm. We do the same thing. If you purchase from us in a larger quantity, the price is less per item. Makes sense from a manufacturing point of view anyway. Making more of the same product all at once is much cheaper. 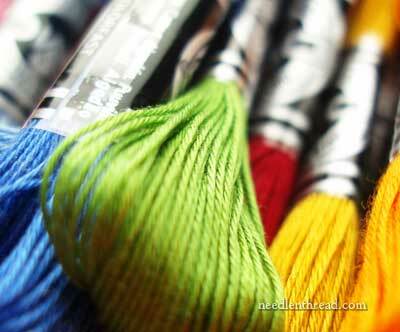 I have been using DMC thread forever, because of its easy accessibility,extensive choice of colors and price. Over the years,I have not noticed any difference in quality. Who cares where it comes from, as long as the quality remains the same. Maybe they want to believe if they say their thread comes from France,that is carries a certain cache.The one thing that puzzled me is their numbering system. I would think that the same color with variations would be in the same number grouping. Why is that? By the way, the medallion you just finished was beyond gorgeous. I am also puzzled by that. I have noticed that some numbers used to be other numbers and some have stayed the same, I asked them about it once, after inheriting some floss from my granma (her artritis got so bad she could no longer embroider) and never recieved a reply as to which colors used to be which numbers etc, I have noticed that DMC only answers SOME of my emails. I use DMC threads for all my embroidery projects . I like their reliability of supply, the smoothness of the threads(no humps or lumps), and I feel confident that their colors will not bleed when framing my works. The price is also important when I have to buy dozens of skeins especially for thread painting. Have a nice day. I’ve used DMC floss for many years, and also have Anchor floss. I’ve never had a problem with either, although I must admit, my output of needlework is sorely lacking lately. The biggest kerfluffles I remember from when the needlework newsgroup still had a lot of activity in the late 1990s to early 2000s, was differences in certain colors, especially black (I think Anchor was favored for that) and also when DMC changed color formulas for some color numbers, and then the old and new stock didn’t match. Another discussion was the colors – IIRC, Anchor had more colors, but DMC had more ranges of colors. What I mean is while Anchor may have had 15 separate colors with light/med/dark shades of 10 of them, DMC may have had 12 colors but a light, med, dark shade of each for example. I’m not sure how to explain it. Something different with anchor that I like, can’t put my finger on it, but I like it. If I had my choice and the funds I would use all silks…but I can’t. Dmc’s availability is probably one of its best assets. I have been using DMC since the early 80’s and haven’t found differences in quality, then again maybe I just haven’t paid attention. and the price (makes experiments that bomb out not a problem!). I like not only doing the traditional stitching we think of with these threads but also needlepoint with perle cotton (no laying of threads). I use lots of kinds of thread but the DMC threads are the bedrock of my thread stash. I use DMC thread and have always been pleased with its quality. But recently I noticed that a chain fabric store started carrying a less expensive brand, made in China, that does not appeal to me. This same brand, I think Sullivan’s was perhaps the name, was also advertised in the Embroider’s Guild magazine. I was surprised. I much prefer DMC. I have also heard of Sullivans, a craft store close to my dads cousins house carries it also. I have never tried it however, since I have a stash of DMC at home it is not necessary since we only go visit twice a year. I used to work in a chain fabric store that stopped carrying DMC and started carrying Sullivans… after several stocking sessions, I noticed some of it came boxed in DMC boxes. I became personally convinced that the Sullivans was DMC thread that didn’t dye right. The same number/color would vary from box to box in the same shipment, let alone from one shipment to the next. I could be completely wrong, but I think that Sullivans is just DMC’s way of off-loading bad dye jobs. Just my observation, YMMV and if someone has evidence to the contrary, i will gladly change my opinion. I use several different types of floss just to experiment but primarily I use DMC. What I’ve noticed over the past 25 years or so is that the colors have changed slightly. If I have some older floss, use it and need some more with the same number, it’s not always the same. I’ve learned to check my thread stash before starting a project. Now I have bits of old that’s I’m keeping for smaller projects and using new for the larger projects. I’ve also noticed the threads are not the same diameter; some seem thicker or thinner than others and that affects coverage. And a few times now I’ve bought new skeins only to unwind them and find a knot in the middle some place, as if they finished one batch and tied on a new batch. Overall though I’ll keep on using DMC since it’s so easy to find. Unless I am using Anchor threads for their sublime colours, I use DMC and see no reason whatsoever to use anything else. Thank you for pointing us towards this issue. It is reassuring to know that it is still made in its country of origin and not somewhere in the East, with the inevitable drop in quality that would bring. I use all of their threads from stranded cotton to perle, from their metallics to their satins. And everything else too. They are good quality, the colours don’t run and they are readily available. The latter does not unfortunately apply to Anchor threads. They need to jack up their agents because their quality and colours are good, but it’s so hard to get a regular supply. Hi, I am pretty sure the difference in European and US prices results from the substantially higher labour costs for employees in stores and the average European VAT (sales tax) of 20%. UK online stores are much cheaper than nice little shops in the city of Vienna where one DMC skein costs approx. € 1.30 ($1.60). That’s almost unaffordable for large projects. Therefore thanks to sewandso.co.uk (Within the European Union, no cusoms duties apply). And also thanks to you, Mary, for a wonderful website and your daily newsletter. I own a full range of DMC that dates back to 1977 when cross stitch was all the rage. I add colors as they become avail to keep up my set. However, I have found that the DMC I buy today seems to be inferior to those older threads I have. Especially when using one thread, tangles and breaks quite easily. Recently, I was introduced to the Cosmo threads. They are color fast, overdyed and have a wonderful sheen to them. They feel silky to the touch. I have been using them on a quilt that has 17 blocks of Bird’s Nests. I started with DMC (all the stitching is in one color), so I need to finish. I have embellished each block with a subdued color to give it more interest and have added the cosmo variegated threads for this task. I do like the results. However, my all time favorite threads are Silken Pearl and Valdani threads for fancier stitching. It is great fun to have “choices”. Thank you for being such a wonderful resource. I have coffee with you each morning! I love DMC, I like that it is an old established company that still produces a quality product. I like that they add to their lines with new products and new colors. I like that it is widely available and still very affordable…while there are other good threads out there, I would not be able to do like I do with my stitching if all the threads were as expensive as some of the others are…and I like the feel of cotton thread and use a lot in things that get washed so the colorfastness is important to me…thank you for this article. I found it very interesting. Your email about DMC products was very interesting. I love working with DMC because I know the quality will be high and colors consistent. (One skein of color 988 will be the same color as another skein of 988.) I recently finished a kit which included another brand of floss, and I will disappointed and frustrated with it. The floss was not as smooth and easy to work with, and frayed a lot more easily. If I have a choice of brands, I always go with DMC. Back in the ’80s, I worked in a needlework shop. At that time, DMC was very restrictive with their vendors–they only sold to needlwork shops and the shops were restricted in the pricing of the threads. Then they began selling to big box stores and those stores were selling the floss much cheaper than the independent needlework stores’ wholesale purchase price! It was a huge blow to the small retailer (and I’ve never quite forgiven DMC). I also think it was not a good long-term strategy for the company. Just a bit of history. I haven’t checked recently but in the ’90s I was able to acquire DMC threads in Germany, England and Italy that were not available at all in the U.S. Some were additional sizes or colors to thread lines available here and others were new-to-me threads. I felt like DMC didn’t think much of American stitches to exclude us. Then I learned we had lower pricing and some other thread colors and weights that weren’t available elsewhere and I calmed down a bit. I was lucky enough to be the beneficiary of my aunt’s floss stash when she stopped stitching, so I have lots of ’80s and ’90s DMC. I’ve been slowly replacing colors as I run out, and not only have I not noticed a difference in quality, I’ve been impressed at how close the colors still are in dye lots 20-30 years apart. Maybe I’ve just been lucky, but I’ve had to mix old and new on a project, and not had there be a discernible difference. DMC has always been my go to thread once the price point lowered. It is of a good quality. I used to use the American made thread but once I used the DMC and the shine it gave I was hooked. I hope no one monkies around with it. I only buy DMC floss. I have recently started using Valdani 12 pearl cotton on some felted wool projects. I especially like the variegates for the slight subtle color changes to compliment the wool. They have some great colors and are colorfast. I have a terrible memory, so I can’t recall all the details, but I think the reason that DMC is cheaper in the US than in France is due to a post WWII treaty. For either 50 or 60 years (immaterial, since both times have already gone by now), France agreed to reduced prices to the US for a variety of things, I think as a payback for all we spent on the war. I remember a big panic a few years ago when that time period was ending, and we were all afraid that the cost of DMC would skyrocket. I just recently had a close call with a deep DMC red (I think it was 819) running. The piece was already ruined, so in desperation, I used a Chlorox stylus applied directly to the areas the color ran. It got most of it out without damaging the nearby stitching. Phew! I have also had several issues of late where the colors were dramatically different. But all that said, I am still a fan of DMC. I find Anchor considerably less sleek and only use it if forced. I LOVE your newsletter. Thanks for all you do…and share. When I began embroidery in the 70’s I used DMC exclusively because it was the only one available. You cannot beat DMC for color selection but they do have a bit of “fuzziness”. I’m always on a search for a smoother looking thread. Recently I bought some Cosmo which I really like-they have a floss you separate and a spool which you don’t but the spool a bit thicker. Recently I found some Valdani which you don’t need to separate and it feels so soft. I just did a lazy daisy and loved the thread! The variegated colors are beautiful-very muted. I will have to try more stitches with Valdani. I’m surprised that no one has mentioned Prism- made by DMC. It is a lower cost, lower quality, not shiny thread, but it is made by DMC. Some skeins are the same quality and some are NOT- I find it really hit and miss, but it is about 1/4 of the price. So no need to wonder if DMC produces different qualities of floss- they do! Re: Prism – a few months back, my local Michaels chain store started stocking the Prism thread packs. Most are floss, in bright and variegated colours, suitable for kid’s crafts and friendship bracelets (and very matte, almost like DMC’s flower thread was, as Kim mentioned), but several packs, to my surprise and delight, were pearl (perle) cotton! Both were sold as “craft threads”. I had no idea until I got home that they were made by DMC (they are on the DMC website, but I had to search the site for the name), and really wish that DMC would put their name on the label! I think more people would try them. Since the threads come in such large packs, it’s easy to dismiss them as cheap ‘off brand’ quality! There is a difference in DMC thread depending on where you purchase it. I purchase mine at a small shop and get good thread. I gave some of it to a friend, she ran out of a color and ordered more online from a larger store. The quality was terrible. Even she could see the difference and she was a beginner. I went to another big store and they had the same poor quality thread. Maybe the people in France can’t tell the difference, but I can. has so far been colorfast, but we never know for sure, do we. I use DMC for my projects.I had a predilection for Wool Médicis. No more Médicis DMC. Heureusement, j’ai hérité d’une grosse quantité de Médicis pour mes travaux en Crewel. DMC est fidèle à son image: fil lustré, stable, variété de couleurs, etc. Mon aiguille l’aime bien. Le video DMC est très intéressant, surtout que, pour une fois, il est dans ma langue, le Français. Merci Mary Thank you Mary. Les fils coton DMC sont réalisés à partir de la plus belle fibre de coton, le coton longues fibres d’Egypte. C’est ce qui le rend particulièrement résistant et régulier. C’est du “made in France”, DMC fabrique ses fils près de Mulhouse. This article is saying that Anchor thread made in Germany has a ecologic label.And DMC made in France is from egyptian coton.That is why the thread is strong and regular. Myself I `m buying my DMC in France and in the US without finding any difference of quality. For DMC SPECIAL I have been asking store in NY to order some for a long time now.They are not interested. Thank you so much for all of the research and effort you exert for your readers! Your website is a highly reliable information source and covers most of the topics a needle worker needs to know about. I am very interested in DMC quality since it is the most widely available thread in our area. But I must have confidence in the advertised quality. If two DMC items have the same labels of content, then I expect the products to be exactly the same regardless of where I buy them. Our local Wal-Mart is now selling DMC floss. I expect it to be the same product that I purchase from a local specialty shop if the labels read the same. If that is not the case, then DMC needs to be changing the labels, so a consumer can make an informed choice. Don’t post often but I read you everyday. Love the gently campaigning articles – the one on needles was interesting. Just completed total collection of DMC floss – if it’s good enough for Trish de Burr! I have noticed a difference in feel as I’ve bought them but have found the same with other makes, even silk and wondered if the colour (dyeing method) plays a part? Do some dyes damage the fabric more than others? I use DMC stranded floss most of the time and am happy with the quality and availability. I have used floche and coton a broder and liked both, but as you say, they are not as easily available. The last time I looked the local Hancocks stocked a brand of stranded floss I had never heard of. I didn’t even consider buying it because I thought it probably was a cheap and inferior product. Very interesting to see how it is made and that they refer to the thread as wire. What does DMC stand for anyway, I have never known what it is short for. I have some from when I was young in the 60’s and first started embroidering. I almost always use DMC threads. I’ve used Anchor, when its in a kit, and I just don’t like the feel of it. I’ve used specialty threads when called for, and I don’t like some of them. For some designs, I like the verigated threads from some companies, but most of the time, I change my threads to DMC. I have used DMC floss for about 40 years and I HAD NO IDEA floche and coton a broder existed!!! Why is DMC sitting on that? I used to use the 6 strand but tangled it up when separating. Right now I’m using pearle cotton for wool felt embroidery and love it, but I’m ALWAYS in the hunt for something silkier and better. I’m thinking DMC needs to get some serious marketing going on, I’d love to try some of it and will happily pay to do so! What are your thoughts on Flower Thread by Ginnie Thompson? I am just getting back into thread work. I used Flower Thread years ago. I have used DMC for many years (30+) and have enjoyed all the benefits listed by others (price, availability, etc). I have also used Anchor which has a different twist to the fibers which I did not prefer and it was considerably more expensive for the project. I have also used Sullivan which I would probably not choose again because it felt and seemed to work more cheaply (knots, twisting, etc). Having used DMC for so long, I know that many colors have changed over time and some colors are not being carried by stores anymore (unless you can request it to be added to an order). I have also found that some colorways are up to 5-6 colors and some are limited to only 2. Having said all that, I like DMC and the range is usually plenty for my projects but times have changed and I think pollution has added to the inability to manage colors, etc. I have also used lots of over-dyed fibers and their consistency between dye lots can be pretty different. Sometimes I use more thread than I anticipated so that can be an issue too. I love the newsletter and always learn something! Thanks. Hi Nancy, Another enjoyable article. I have been doing hand work for most of my 67 years. I got really serious about it 45 years ago and since have tried a good variety of fibers in my work. I so liked the DMC threads that at one time I owned a full complement of them and kept collecting as they came out with new ones. In that time, I have found a diminishment in quality. I gave up using them for smocking some years ago as I found they left “lint” on the fabric. I now use Anchor for smocking. Hard to explain exactly but they are just not as nice as they once were, to me. I have used DMC almost exclusively for my projects. One thing I would like to see in stores and called for in patterns is their new “Color Variations” floss, which isn’t fully variegated and (I’ve heard) isn’t as difficult to use as some of the variegated ones. The only problem I have with DMC is that (in some colors at least) it tends to fray. Pretty much all my skeins are 2-3 years old; maybe I should get some newer ones. It may all be made in France, but it wouldn’t surprise me to discover that “mass market” stranded cotton is manufactured from a shorter staple of cotton than the EU market stuff. There just doesn’t seem to be any other reason that a skein of DMC blanc neige in Holland should cost me the equivalent of 1.55USD when it’s .35-.50 here in the States. It’s still my go-to thread, though. I like the color stability, the range of colors, and the hand quality is good for the type of work I do, which is mostly smocking or cross stitch. It’s also available everywhere, unlike Anchor and Presencia, which I have to mail order. Coton a Broder is delicious stuff to work with! I took a class with Wendy Schoen a few years ago; that’s what we used and it was so smooth and produces such a lovely effect. I love your newsletter and never comment, but I just had to today. I e-mailed DMC in late 2007 because there were some on a public forum who were saying that DMC was inferior and the floss sold in the big box stores was not the same as the thread other stores. DMC makes only the highest quality floss and sells the same quality to all of our outlets. It is 100% long staple Egyptian cotton, a six stranded divisable thread and is double mercerized. We have well over 250 years of experience manufacturing this item and it is considered one of the finest available on the market today. We are sure once you compair floss, you will agree. I almost always use DMC floss for cross stitch and if I tie quilts I use their heavier weight threads. I have been using DMC for over 40 years, mainly because it is so readily available and because it is inexpensive for projects that get used up such as kitchen towels and pot holders. Love it! Interesting this came up today – K just bought a skein of DMC this week that I thought felt “stiffer” or more linen like than normal. First time I’ve ever noticed it though. I use DMC floss, floche, coton a broder and sewing thread! What I really like about it is that the colors all match among the various products, so that you can use any color of embroidery thread and sewing thread and be confident that they will match. The floss is lovely, has a wonderful sheen, and is the best to use for monogramming small letters. What I don’t like about DMC is that they state very specifically on the floss, but not any other product, that it is “For sale only outside the European Union”. What’s up with that? And why won’t they tell us about it on their website? Don’t get me started on that useless website! I find it interesting that you buy your coton a broder from Vaune Pierce, who advocates using coton a broder or floche for smocking as it is colorfast, rather than using floss, which is often not. She states that many of the floss colors are not colorfast, even though DMC claims they are. After reading your posting today, I took a very random and unscientific survey of my DMC floss and found that many of the colors were not labeled “colorfast”. This surprised me, especially since I found the label missing from some of the same colors that were labeled “colorfast”. The DMC website claims unequivocally that all their threads are colorfast, even though they don’t label them as such. None of my skeins are particularly old, so I have no idea why some skeins are colorfast and others not, especially in the same color number. What also disturbs me is that the skeins we buy in the US (and Canada and S. America, I imagine), state very clearly that this product is “for sale only outside the European Union”. Now, why would that be? Many people have surmised that it is because the dyes used in some of the colors are of lower quality, which makes the floss meet the price point demanded by the “big box” stores in the US, such as Michael’s and Joann’s. None of the other floss companies have this stated on their label, but then again they are much more expensive. I have quite a bit of Anchor floss, two skeins of Presencia, and none at all of the other brands. The only reason I have Presencia is that it came with a kit from Country Bumpkin. It seems OK, but as I lost the labels I don’t know if it is colorfast or not. If I wash anything embroidered I throw in a color catcher, which doesn’t keep the dyes from running but does prevent them from attaching to another fabric, especially a light colored one. At any rate, I will continue to use DMC products, especially as I have enough to last me well past my lifetime. One more thing, Mary, please post these provocative articles on the weekends! I am up way past my bedtime, but I felt I had to answer this. Tomorrow will be rough at work. DMC is my “staple” thread, you know, just like all my staples in my food pantry. It is always in my stash. I have a beautiful wooden cabinet which DMC put out several years ago which opens to draws containing rows of slots to house my DMC floss. I love to look at all the pretty colors. I also have used the Anchor and Presencia threads, but these are difficult to find. Anchor and DMC are available where I live and I usually use DMC because I just like their colors better. A shop near my home started carrying Presencia embroidery floss and I have been using it as well. The colors are lovely….different shadings than DMC….and it is available in a wide range of colors. I haven’t noticed a decline in quality of DMC threads, but tend to agree that the VAT tax alone would increase the price of thread in European countries. Okay Mary. Here is a thread question for you and the other blog followers. Recently I went to a Quilt Show in Columbus, Ohio. A beautiful quilt was done up and displayed that had both traditional quilt blocks and an embroidered panel. I fell in love with it and will be attempting to make it for my granddaughter. When I went to the vendor’s booth to inquire about the pattern the gentleman there said that the embroidery was done in “Sulky 12 Weight” thread. I’ve never used a thread that comes on a spool to embroider with. It looked like quilting thread for hand quilting to me. What say ye? Any thoughts? “Sulky” threads are usually rayon, I think. I’ve used rayon floss once and altho it had a beautiful color and sheen, it was unbelievably slippery to work with! YMMV, of course. I use lots of DMC and have some from the ’80’s in my stash. I have had diffent dye lots a couple times and some older threads, even though stored out of the light are very different than newer threads. The biggest thing affecting quality seems to be when I use too long a piece of thread. With exceptions for drawn or pulled thread and such, shorter is better. The “for sale outside EU” label may refer to the VAT added to every step of the manufacturing process. They don’t pay that for export items. One thing that really affects threads is the quality of the Cotton or linen it is made from. Egyptian cotton is excellent but varies by region, soil quality, rain, even fertilizer. That can affect the end product we see and DMC and even Sferra, the high end bedding manufacturer have to buy cotton when available and a lot of it and it varies from season to season. Funnily enough, I was cursing DMC last night! They’re pretty ubiquitous here in the UK, we’d pay about 90p a skein in a chain store, and as low as 60p online – I’d be interested to know how much they cost in the US? The reason for my cursing was the frequent knotting of my thread, even though I wasn’t using lengths that were too long. Several times I had to cut the thread out. DMC 6-strand floss averages about $0.40 a skein at the chain stores. None carry coton a broder and floche. I get the same knotting problem, especially with the darker colors. I switched to Cosmo floss for the more important stuff. Skeins are 3x as much as DMC, but I find I can use longer lengths and it rarely knots. The two craft stores I go to both sellt he floss for 35c a skein, and about once a year they have a 4 for 1$ sale. I usually bolster my stash basket then. Mary I love your blog and newsletters. I hope to have more time to comment more often . I have a couple of questions re DMC threads. First, though, I want to thank you Mary for putting so much time and effort into your site. When do you get a chance to work on your own projects? 1) What are coton a broder and floche? The closest store to me that might sell them is 3 hours away, and though I’m sure I could get them online, when I’m buying something I haven’t seen before, I like to see it in person before I buy it. 2) I just realized my second question doesn’t really apply to embroidery. I do a lot of cross-stitch, where you’re told what colors to use where. Finding conversion charts between different kinds of thread is nearly impossible. For example, Gentle Arts Sampler threads are named, not numbered, so a conversion is difficult (although I have found one for GA to DMC, it doesn’t cover all the GA threads, because some of them don’t have a DMC equivalent. But in embroidery the choice of color is up to you, although I still have to learn what size thread to use when using perle cotton. For some reason, the only brand I can find doesn’t give the size on the label! Oh, how I wish there were a specialty needlework shop near me! Here is my French point of view. I mainly use DMC cotton threads, as they really are the best one. And I am jealous because, yes, they are more expensive in France. Why ? Probably because every brand of threads is more expensive here. So if we are willing to pay this price, why not make profit of it ? I inherited a buch of Coats & Clark floss and a little Anchor from my Grandmother’s stash, and mostly bought C & C because the craft store closest to my work carried that. Then they closed. There was a fine-needlework store a couple blocks farther away (when you’re walking, that means several minutes less to spend looking at thread! ); they carry DMC so I started buying DMC. I like all three brands, Anchor is probably #3 preference but I will use it. Certain colors I’d prefer in one brand over another. I didn’t know floche or coton a broder existed, either, until a couple years ago . . . soon, I’ll be experimenting with them. P.S. Some of the questions over where DMC (and other) threads are made, for an increasing number of stitchers, comes from concern over HOW they are made: ethical sourcing of raw materials, worker safety, environmental impact . . . .
Do you know a translation table from Therese de Dillmonte’s DMC threads to modern day colours? I asked on the DMC site months ago and gotten no answer – I checked only recently. I love DMC threads and use them over any others unless I specifically need a hand dyed colour. They are pretty expensive here in the UK but as I’ve no intention of changing to a cheap inferior thread then I’ll keep paying whatever is charged. The only downside I’ve found is that the black colour 310 seems to be very thin, great for outlining but not for solid stitches so I use the anchor equivalent when I need to. Hi, Could you please tell me how to interpret the different numbers! I’d like to try them but need a reference point for the numbers to start. I have used both DMC and Anchor. I like the feel of the DMC thread better. I also know that the thread will not rot when it gets old. I just prefer it. I’ve noticed how much popular DMC threads are in comparison to the UK where it’s predominately dominated by Anchor. Although I find no fault in either brand and would use either manufacturers for my projects. What is a huge, huge difference is the retail price of threads. Here in Michigan our JoAnn retails the DMC normal threads at 39cents [I think], in the UK you’re paying the minimum $1.17 for the same threads [although you can buy it cheaper online]. That price difference to me is incredible. When I started doing Cross Stitch in high school (40 years ago! )many of the patterns listed DMC, Coats and Clark or Anchor thread. I found C&C did not have the variety of DMC, so I found myself using it exclusively after a few year. Then, when x-stitch became the “it” craft of the 80s and 90s, all the patterns in books, magazines (so many magazines! )and leaflets, DMC was generally the only thread listed in the color list. It was easy to find and I had very little trouble getting just the shade I needed and completing my projects. For my projects, it is the perfect weight and true colors. My latest project is a Mary Englebreit design for a Christmas stocking for my grandson. I’m always extremely pleased with the results of my projects. I recently restocked my supply and have not noticed diminishing quality; I use thread I bought in the last decade the more recent ones and they all perform as expected. While I started using DMC as a default, I have since had the opportunity to try other brands (they often supply conversion charts)but still find it the best for my needs. I look forward to teaching my grandchildren how to embroider and cross stitch the way my Nana taught me and I will be using DMC thread! Thank you for this very interesting article! I do have a LOT of ‘vintage’ DMC which I will be working through for a while, but have never tried coton a broder or floche (only have stranded). Will definitely try them now. Does DMC even have a color wheel type list for thier flosses or at least a list of light to dark color numbers since some of the groups are no longer in sequence? Their only color wheel now has prints of the color, not the actual floss. I wish I could find one of the older ones. Anybody have a clue where I might find one? Of course, it wouldn’t have any of the new colors they’ve added since they stopped making it with fabric. Not perfect but gives you the basic idea. Mary, thank you for the wonderful articles and information that you share. I use DMC as that was what I inherited from a a great-aunt in the 80’s. At the time, DMC and Coats and Clark was all there was. I have been stitching with DMC since then and have found that the floss I get in the stores now is not even (thin and thick) and not as mercerized (very fuzzy). I do not like it; however, once stitched, I can’t tell a difference. I just don’t like how it feels any more. I have about 70% of the entire line of colors so it’s unlikely that I shall switch any time soon. I also think that DMC is rude in ignoring requests for information.They also don’t make all of their products available in the states and that makes me bonkers! !I prefer how Anchor looks once stitched up, but again, am not about to start a whole new collection of threads. I really do wish there was another brand as easily accessible and affordable as DMC. I see that there is another brand called Prescencia…but how long will they be in business? I am stuck with DMC but I suppose it could be worse (no DMC or pay over a dollar for one skein of the stuff). They can afford to be rude, I suppose. A question about coton a broder #25, Mary: What’s the gauge like? Close to #12 pearl cotton? Finer? I’m curious…. I noticed the quality changed in DMC many years ago and stopped using it. I still use Floche as I do love it. If using floss I now use Presencia. But I mostly use Silks in my work for the sheen, strength, & quality. It would not surprise me if DMC is outsourcing the majority of their lower end cotton floss to other markets. I just wish they would re-introduce flower thread again, I did love that thread when they had it. I have noticed a difference in the DMC products available in Canada vs those available in Europe. The European threads seem to be quite fine compared to those sold in Canada. Also, DMC has products which are available only in Europe and not in N. America. Don’t understand why. Anita, there are also threads in USA not available in Europe, e.g., floche. I can buy that online from US sellers, but have never seen it in the shops here. UK VAT may account for a difference in price, but only at the very end. It doesn’t, or shouldn’t, increase the price at each stage. Every seller in the chain registered for VAT can claim back the VAT they are charged, and then charge it on to the next buyer, accounting for the difference to the Revenue. In that way, it becomes a consumer tax, with only the final purchaser (John Q Public i.e., me!) bearing the tax. I have often wondered if the DMC threads in the USA are American cotton sent to France for process and returned to the US? That would perhaps avoid some import duty. I dislike the fact that DMC do not answer E-mail queries. The French site and the U.S. ones are quite different. In terms of DMC tapestry wool, colours that are nominally the same do not match. For example, I have 7311 silver banded, 7311 and 7311 (0575); the colours are noticeably different. This is without considering dye lot differences. This does not give me confidence in matching colours in DMC floss. I used DMC thread (varigated) to do a Hardanger project. It is done with red/ green varigated. A friend did the same project and when she washed hers, even after being very careful, the colours ran. She is a very experienced stitcher and has done many pieces. I’d like to know if there is anything I can do before washing my piece to avoid having this problem. About 3-4 years ago I read over instructions for an EGA GCC blackwork piece. The instructor told her students to be sure to purchase their DMC cotton threads (the standard 6 strand floss) at a cross stitch shop, not a big-box store. She said she used to own a stitching shop and knew for certain that the DMC 6 strand floss sold in big-box stores was inferior to that sold in stitching stores. At the time I noted it, but was skeptical. I pretty much forgot about it since I didn’t use cotton threads at that time. About a year later I was designing a counted blackwork teaching piece. I decided to use cotton threads to reduce costs. I bought a skein of floss at AC Moore and started stitching. I’d been stitching counted blackwork for 10 years using silk. I was using one strand of dmc cotton floss and my thread kept thinning and breaking. I shortened my thread – same problem. At first I thought it was the difference between silk and cotton. After several attempts I recalled the EGA instructions and decided to test it. I bought a skein of the exact same type and color from my local stitching shop. I had no problems with the thread at all, under the same exact conditions. Admittedly, I would need to purchase many more skeins of different colors from several big-box stores to conduct a truly scientific test, but that was enough for me. I won’t purchase 6 stranded floss from the big-box stores. I love DMC thread. I have wanted to do the project called the Angel of Cross Stitch which includes all colors of DMC thread (or at least what was available at the time). The pattern was published in Cross Stitcher Magazine June 1999. Does anyone know where I could obtain a copy of the magazine or the pattern? Thanks! I’m worried about this possibility that the company is still outsourcing cheap and unfair labour. I love making pretty things especially with mouline thread but I want to make my pieces from fair trade materials. DMC and Anchor don’t seem to have any guarantee on that. Am I right? If so, do you know where I could buy fair trade and sustainable materials? Can you explain to me the difference among DMC needlepoint wools with black label, brown label, or gold label? I have some of all three and I cannot see any difference visually. I’ve always used DMC thread. But yes, I also feel that there is a decline in the quality of the floss. And I read somewhere that there are imitation DMC cotton floss being sold – I hope it’s not true. I have a very simple project, but it calls for the floss color called Linen. Do you have a suggestion on what color floss I might be able to use as a substitute? Hi, Cristina – I’m not a retail site, so I don’t sell threads. I think you should find a shop in the UK that can help you out, though – I’m in the U.S., and anything here would not get to you on time. 5 años, y hoy casi con 79, no puedo abandonarlos. Disfruto su tersura, su excelente torsión, y la variedad de sus colores, que son inalterables aunque se los someta a lavandina, o lejía. Uso la mayoría de sus tipos, Mouliné, Cordonné para Tatting, Cordonne Especial Encajes, el N* 25, para bodar a mano alzaada y en bastidor. Los Perlé N* 12 en ovillo completando con el Perle.N* 5 en madeja, para realizar el encaje Ruso en Encaje de Bolillos. Para Tatting (Frivolité) o trabajos delicados en crochet, es inmejorable el Babylo, que aunque lleva la misma marca DMC, está fabricado en Bulgaria. Muy buenos tus artículos. Es un placer leerte. Gracias! !